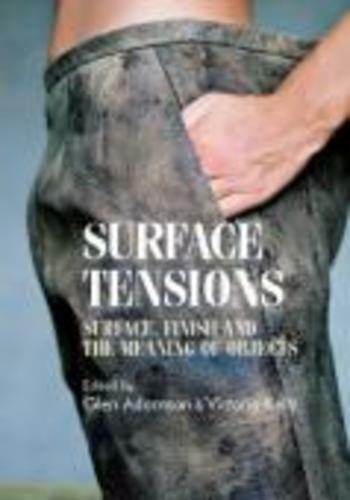 Surface Tensions, co-edited by Adamson and Dr Victoria Kelley, is a volume of 16 essays concerned with the theorising of ‘surface’. In the book, surfaces are discussed by an international range of writers, including historians, anthropologists, theoreticians and practitioners, as both historical evidence and zones of artistic experimentation. Subjects range widely across disciplines (topics include domestic maintenance; avant-garde fashion; the faking of antiques; postmodern architecture and design; and contemporary film costume). As a whole, the book provides insights into the whole lifecycle of objects, not just their condition when new. Surfaces are often held to be of lesser consequence than deeper or more ‘substantive’ aspects of artworks and objects. This book sets out to contextualise this evaluation, demonstrating that it is possible to conceive of the surface in more positive terms: as a site where complex forces meet. Surfaces can be theorised as membranes, protective shells, sensitive skins, and thicknesses in their own right. The surface is an opportunity for encounter: the last point of contact between maker and object, and the first point of contact between object and user. Adamson co-wrote the introduction to the volume with Kelley and contributed a sole-author essay on the subject of the postmodern surface – an extension of his work toward the V&A exhibition ‘Postmodernism’. Of particular interest here is the reflective and fragmentary nature of the postmodern surface, which has often been taken as a metaphor for the dissolution of secure meanings. Against this, Adamson argues for constructing linear narratives about postmodern practice, just as one would for any era in design history, through a full awareness of the movement's affinity for disruption. The book was the outcome of academic workshops held at the V&A, the RCA, and University of the Creative Arts, Farnham in 2009 and 2010.